As the Detroit Red Wings prepare for opening night on Thursday against the Columbus Blue Jackets, there’s a different theme about this upcoming season in Detroit. Look no further than at center ice, where for the first time since the 1990s, the Wings logo will be featured without the famous “Hockeytown” moniker across the middle. This seemingly simple aesthetic change signals something much deeper: a new era of Red Wings hockey has begun. When the Red Wings debuted the “Hockeytown” theme just before their first Stanley Cup victory in 1997, fans embraced it wholeheartedly. Detroit was the capital of the hockey world, a dynasty built upon the backs of hockey legends. 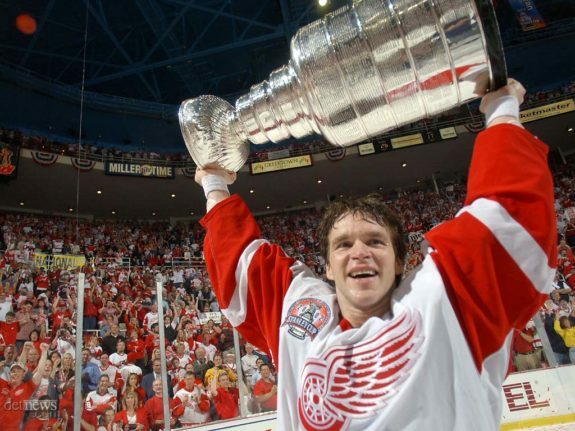 Take for example the 2002 Red Wings, who boasted a core of 10 Hall-of-Famers: Steve Yzerman, Luc Robitaille, Brett Hull, Sergei Fedorov, Brendan Shanahan and Igor Larionov at forward; Chris Chelios and Nicklas Lidstrom on defense, Dominik Hasek in goal and Scotty Bowman behind the bench. When Pavel Datsyuk is inducted into the Hall in a few years, that list will grow to 11. Owner Mike Ilitch gave general manager Ken Holland the green light every offseason to go out and sign the most talented free agents possible to win a championship, and he did exactly that. It was a brilliant strategy, resulting in four Stanley Cups in 11 seasons. Holland didn’t worry about needing young rookies on entry-level contracts like contenders do in today’s NHL. Datsyuk was a rookie in 2002 at the age of 23, and Henrik Zetterberg didn’t make the team until the following season, at the age of 22. Detroit let its prospects over-ripen in the AHL and filled in its roster with veterans who could get the job done. But the game changed, and it started to leave the Red Wings behind. With the salary cap in play, Holland could no longer rely on the Ilitch’s pocketbook to fix holes in his roster. Nevertheless, the front office insisted on maintaining its blueprint: lock up key players long-term, fill roster spots with veterans and let prospects over-ripen in Grand Rapids. Between 2014 and 2016 like Justin Abdelkader was signed to a seven-year contract while Danny DeKeyser received a six-year deal. Both Abdelkader and DeKeyser were born in Michigan, played their college hockey in state and continued on to play for the Red Wings. They’re hometown boys who display the grit and tenacity the organization has always looked for. But simply put, they are nowhere near the caliber of talent that merited such long-term deals. Compounding the problem is the Wings’ trades and free-agent acquisitions from those seasons. 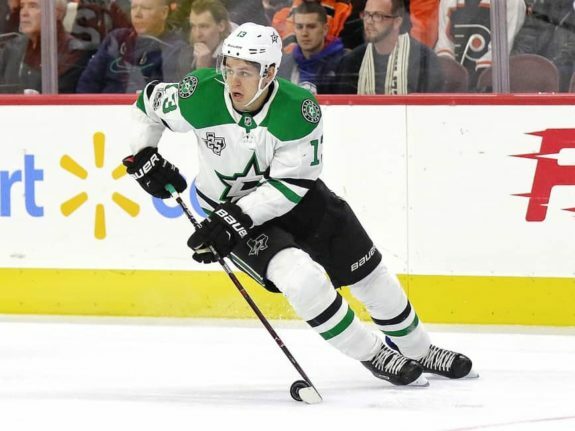 Including all of their trades from the 2014 and 2015 NHL trade deadlines, Detroit gave up Calle Jarnkrok, Patrick Eaves, Mattias Backman, Mattias Janmark, a 2014 third-round pick, a 2015 second-round pick and a 2016 third-round pick. On top of losing early-round picks that are crucial to building toward the future, Jarnkrok, Eaves, and Janmark have all consistently put up 30 points a season since being dealt. In return, the Wings received then-33-year-old David Legwand, 36-year-old Erik Cole and 38-year-old Marek Zidlicky. Detroit was eliminated in the first round of the playoffs both seasons and not one of its deadline acquisitions re-signed the following year. Essentially, the Wings gave up three core players and three picks for three declining veterans and three first-round exits. On top of all this, management continued to bring in more veterans from free agency, like Brad Richards, Steve Ott, and David Booth. These contracts stole roster spots from promising young players in the Red Wings’ system and proved unable to continue the playoff streak, which came to an end two seasons ago. The Wings pushed for the streak a few years more than they probably should have and paid the price, ending up with a roster full of long-term contracts for aging, mid-level talent. Things have been dire in the eyes of most Wings fans for many seasons now, but that gloom is finally disappearing. Over the past two seasons, Holland has begun taking steps in the right direction. He’s traded away players for picks instead of the other way around. The Wings amassed 10 picks in the 2018 draft and already have 11 heading into 2019. Even better, management finally appears to have relinquished the strategy of letting elite prospects over-ripen in the AHL. 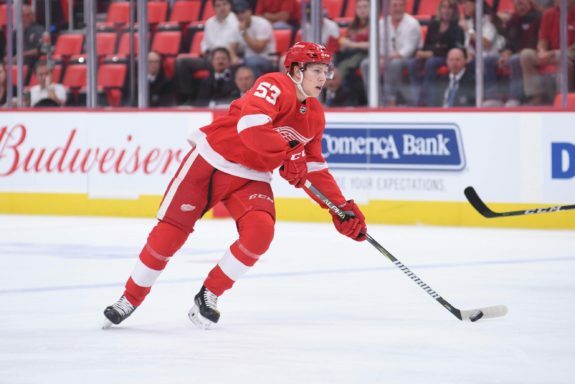 Dylan Larkin debuting for the Wings at 19 with a Calder-candidate season set the tone for the most important move heading into the Red Wings’ 2018-19 season: the influx of youth. With injuries and illness plaguing the Wings’ defensive corps, it’s possible that up to four rookie defensemen—Dennis Cholowski, Joe Hicketts, Filip Hronek and Libor Sulak—could run the blue line on opening night. Additionally, many expected Holland to fill the final spot at forward with enforcer Luke Witkowski or veteran Jussi Jokinen, who was signed to a PTO. Instead, it was earned by rookie Christoffer Ehn, who will make his NHL debut alongside 2017 first-round pick Michael Rasmussen. That’s as many as six rookies appearing in the Wings’ first game of the season. Building from there, 2018 first-round pick Filip Zadina looks poised to debut for the Wings sometime this season and could be called up alongside Dominic Turgeon and Evgeny Svechnikov, who are both still considered rookies by the NHL. These kids looked great throughout the preseason, leading the Wings to a 7-1 record. They have overcome obstacles and changed the fabric of the future in Detroit. No one is certain why “Hockeytown” was removed from center ice at Little Caesar’s Arena, but perhaps it’s because the Wings are beginning a new era. That bold, striking font that was wildly popular with fans in the ’90s has aged, just like their organizational blueprint and former home, Joe Louis Arena. On Thursday night, the Wings are looking to roll out a young team with a fresh direction in a beautiful, new arena. Rookies like Rasmussen and Cholowski weren’t even born yet when Detroit won back-to-back Cups in the ’90s, but they certainly know what a legacy it set. When they step out on the ice at LCA, they’ll look up to the rafters and see championship banners and retired numbers of legends that they aspire to be. No one is certain if they can follow in those footsteps, but it’s time to find out. This season for the Red Wings is all about the kids.